One of my favorite stock car drivers growing up was Bobby Allison. He has a personality that reminds me of my father, and the cars he drove always looked very sharp. 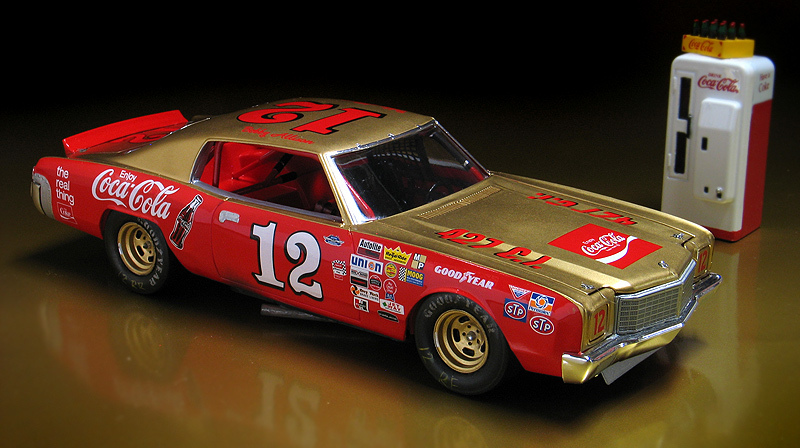 One of my favorites of his cars was the Chevrolet Monte Carlo he drove in the '72-'73 NASCAR seasons. 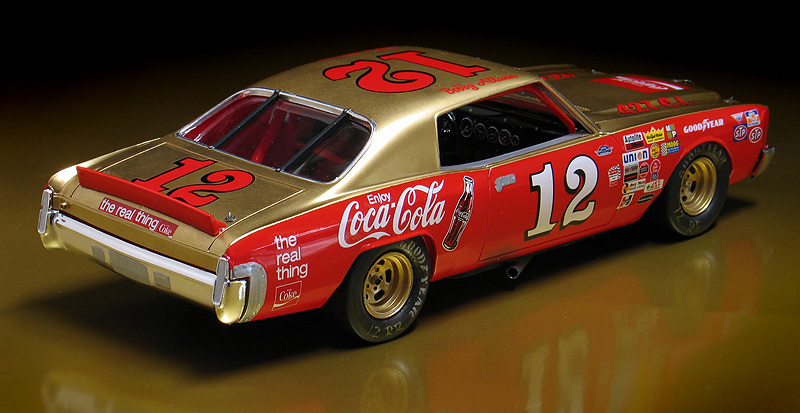 Coca-Cola and 1972 was one of Bobby Allison's most successful seasons. He scored 10 wins and finished 2nd to Richard Petty in the championship. He also set a record by leading 39 consecutive races. 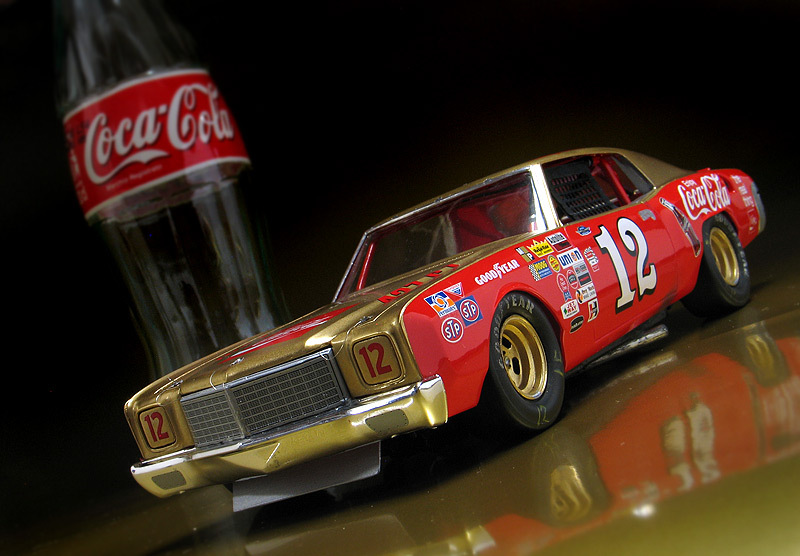 I always liked the look of the red and gold "Coke Machine" Monte Carlo and have wanted to build a replica for many years. I built this replica of his car by using the Model King 1972 Monte Carlo stock car kit. 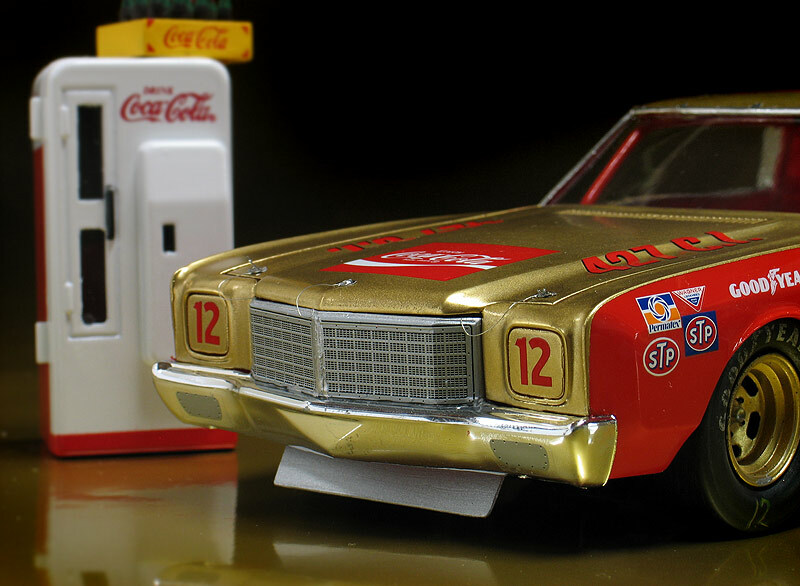 A model kit of Bobby's Chevy Monte Carlo was first produced by AMT in 1972 and was never re-issued. It was a highly desirable kit and prices of mint un built versions skyrocketed throughout the '90's and '00's. Fast forward to 2009. I was designing box art for the Model King and owner Dave Burket asked me for suggestions of what kits I'd like to see re-issued. I put the Allison Monte Carlo on the list (not really knowing if the tooling was still available) and to my surprise RC2 Corp. (which owned the tooling) said they still had it, although it would need some re-tooling done. Apparently, the AMT Allison Monte Carlo kit also shared some trees with the '73-74 Chevelle/Malibu stock car kit. The hood, dashboard, and window glass had to be re-tooled for the Monte Carlo. This is probably why it had never been re-issued before. For the re-issued kit, Dave Burket wanted to avoid licensing issues with Coca-Cola so it was decided to release it with generic decals in a new box. The re-issue box art and decals I designed can be seen here. Luckily, the aftermarket stepped up and created the proper decals to make a replica of Bobby's car. Yesterday's Decals produced a wonderful decal set for the Monte Carlo printed by renowned decal maker Cartograph in Italy. The decal set has markings for Bobby's '70 Torino and '73-74 Malibu also. I highly recommend these. Unfortunately, Yesterday's has stopped making decals but sets should be easily found on ebay. The Model King kit as it's designed builds into a 1972 model year Chevy Monte Carlo. But most of the photos I found of the '72 season show the car with a '71 front end. The differences are small, but the '71 had turn signals in the bumper and a narrower grill. The '72 Chevy Monte Carlo had a wider grill with the turn signals on the ends of the grill instead of the bumper. I converted my '72 kit into a '71 by shortening the grill and filling in the gap next to the headlight openings. When I designed the decals for the Model King kit, I put artwork for both a '71 and '72 grill plus the turn signal fillers for the '71 bumper on the decal sheet. The decal for the '71 grill only needed to be cut into two parts and overlapped to fit the narrower grill. The body of the Model King Chevrolet Monte Carlo is pretty accurate for Bobby's car, but I added a few things to make it better. First, I added the aluminum aero trim work around the side windows. I also then added the fuel vent and overflow tube. The wheels in the Monte Carlo kit were also too deep and the tires too small to my eyes. I replaced them with my own resin cast rolling stock made from the wheels of a AMT Dodge Dart short track stock car mated to Monogram's Goodyear racing slicks. 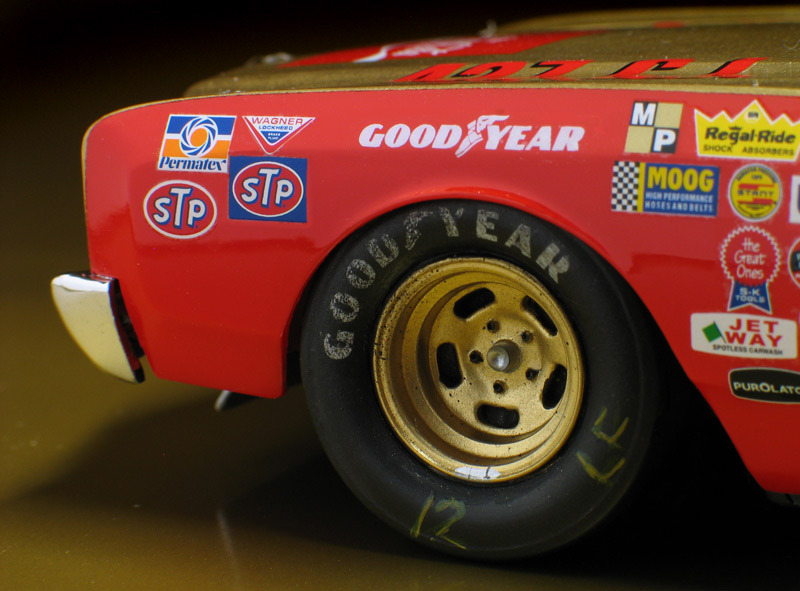 I used the Goodyear tire lettering which is included on the Model King decal sheet, but dry-brushed them with weathering chalks for better realism and added race markings. The roll cage in the Monte Carlo kit is pretty simplistic and too small. I replace it with a better looking cage from a Model King '77 Laguna stock car kit. I also modified the Monte's dash to fit the Laguna cage. The rest of the interior is out of the box. For the paint I shot the car with Tamiya bright red and gold spray paints. Other details include photo-etched hood pins, a scratch-built window net and exhaust pipes made from aluminum tube.